Write for yourself. Talk about the things you care about. Construct an opinion on them. Take a clear position. Then, be flexible — as you learn more, your position might change. This is what I tell myself when I sit to write. I learn (a lot) by reading what others say — but we won't go too far if we don't build an opinion of our own. As Seth Godin would say: Don't hide. Write in public. Then maybe, just maybe, what you write will resonate with your audience. In the event of a disaster, we would probably leave most of our belongings behind. You're not likely — I hope — to care so much about your fancy tea mug, your watercolors, or whatever piece of clothing you own, as to put your life in danger to save them. Today, with the exception of digital information not backed to the cloud and other unique hand-crafted objects, everything we own can be replaced for an item which is exactly the same. After a disaster, great part of our stuff might be gone. If you manage to get out of there with no important injuries, you have, without choosing it, adopted an unsolicited minimalism — you've got rid of stuff without looking for it. No disaster? You might never get around getting rid of stuff. Belongings accumulate and, the more storage space you own, the more you'll accumulate. The thing is: we usually don't care much about most things we own. We tend to only love a small portion of it. Marie Kondo, author of The Life-Changing Magic of Tidying Up: The Japanese Art of Decluttering and Organizing, was interviewed by Tim Ferriss not long ago. She is known as the Japanese tidying master, who created the KonMarie method. Her motto? "Love everything you own." She believes we need to be thankful of our belongings, thank them for their service while we have them, and, more importantly, before we get rid of them. This way, on top of appreciating the item itself, we remove the feeling of regret for getting rid of it (a feeling that frequently prevents people from letting go of things they don't need any more). This, I believe, goes inline with what William Morris said in his 1880 lecture titled The Beauty of Life1. "If you want a golden rule that will fit everybody, this is it: Have nothing in your houses that you do not know to be useful or believe to be beautiful." As a friend pointed out, in Spain we often say that "moving three times equals a fire2." Will you wait for a disaster to take action? Or will you fake your own so you can get rid of the useless and love what you own? It's easy to get trapped in busy work. You are given a brief and a deadline. You leave everything aside and focus on your work to meet a set of deliverables. Finish the task, and you’re all done. Well, there’s a little lie behind this story: you are not completely done—not yet. A project doesn’t exist if it isn’t visible and accessible and shareable and understandable. The job is not finished until you've documented your craft, until you've done some sort of self-explanatory manual that others can peek at without you looking, that others can read without you talking. 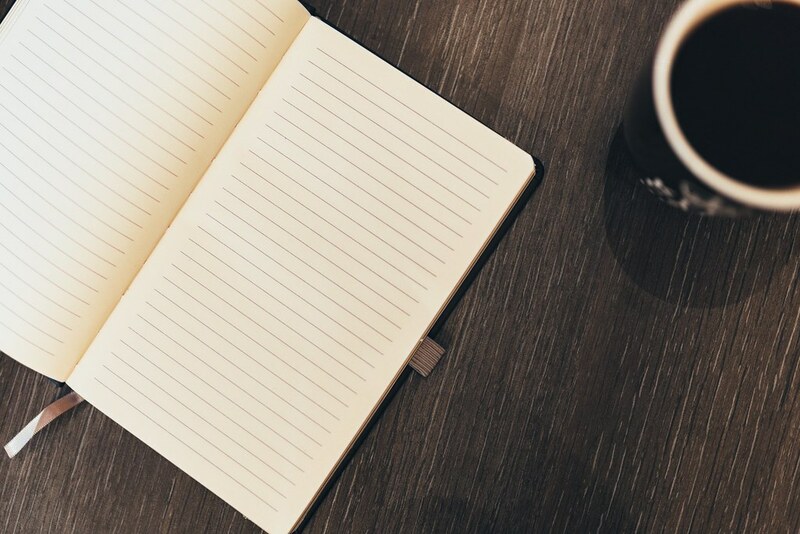 Create it while working (or after finishing)—but don’t forget to provide us with a manual! Over the last three years, I found myself spending long hours reading and writing on how to simplify my life, on how to do less things but do them better, on how to make things as easy as they can be, on how to remove the unnecessary complexities from my daily routine. 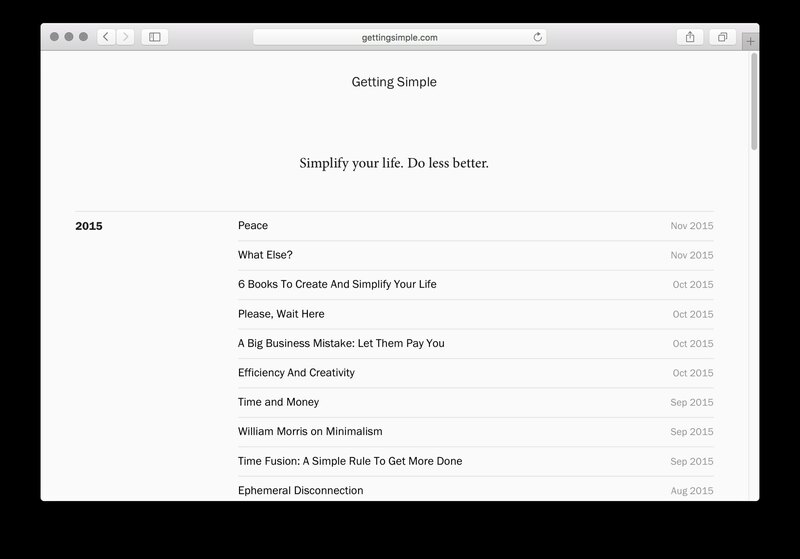 Today, I am glad to announce Getting Simple—a new adventure toward simplicity, a journey to bring the focus of our lives back to the things that matter. Join me on this journey. Sit back. Relax. It all begins here. In a world full of inputs, to-dos, commitments, and notifications; We struggle to find time to do the things that really matter to us. How many times have you said to yourself: "I would love to do X but I don't have time for it?" To accomplish your goals, you need self-discipline, clarified goals, to take your time seriously and to simplify your life, to establish a series of conditions for stress-free productivity. As Dieter Rams puts it, we need to do Less But Better. Simplify our lives; Focus our efforts; and Execute. In order to amplify our efforts, we need to focus on just one thing. Even more important than knowing what to do is knowing what not-to-do. Everything that doesn't contribute to our end goal should be ruthlessly rejected—as it can only distract you from reaching your aim. Be minimal. Reduce stress by simplifying your life: digital systems; physical clutter; daily habits; they all need to be simplified to disconnect and focus on your work. Ideally, you would focus on doing just one thing; do it; then move into doing something else. But in the end, you find so many distractions. Tasks take longer to do than expected. Things get post-poned for tomorrow, for next week, or for never. Again and again, what happens is not that we don’t have time to do stuff, is that we want to do more stuff than we can. What else would you be able to do if you renounce to non-important things? Close to finish what you are currently reading? Take a look at a few books that—in some way or another—changed my life. Getting Things Done: The Art of Stress-Free Productivity (David Allen). Allen presents a powerful way to manage and organize the tasks and projects you want to complete—how to get things done, basically—in order to have a good work-life balance. Get it from Amazon. Making Ideas Happen (Scott Belsky). Techniques and work habits to make your creative projects happen. From the creator of Behance. Get it from Amazon. Unclutter Your Life In One Week (Erin Doland). Even the most common sense tasks of your daily life—as can be organizing your clothes or getting rid of physical clutter—can benefit from fire-proof methods tested by others. In this case, Erin Doland provides a handful of them. Get it on Amazon. All Marketers Are Liars (Seth Godin). A swift introduction to marketing. How to wrap what you have to offer around a story so it can be understood and spread by others. Get it on Amazon. 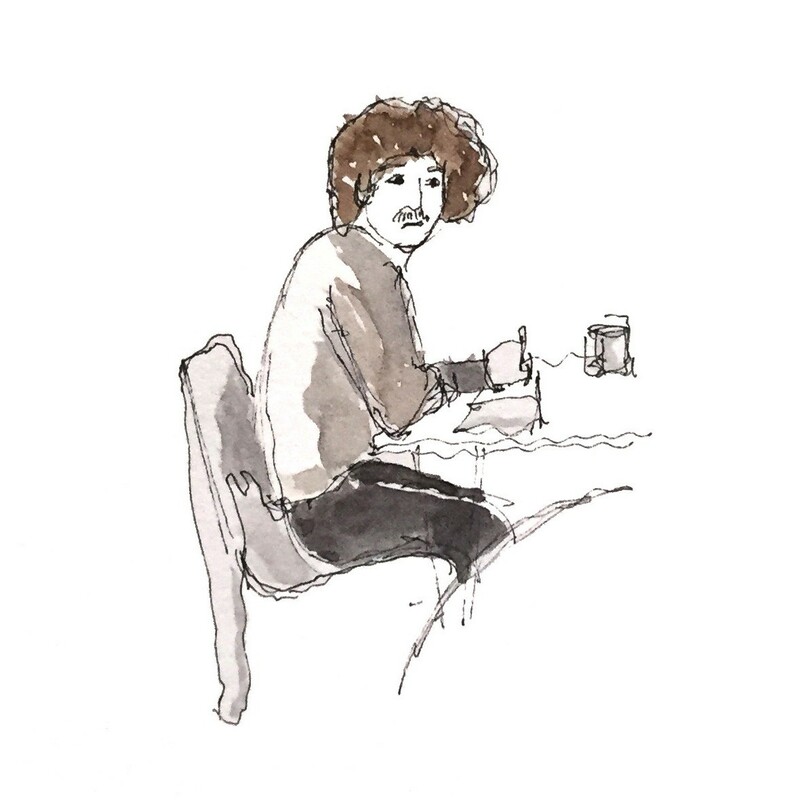 Read Seth’s blog. The Art Of Non-Conformity (Chris Guillebeau). Go away from the life you are supposed to live and enjoy an unconventional way of living doing what you actually like doing and, maybe, making a profit out of it. Get it from Amazon. The 4-hour Work Week (Timothy Ferris). Change the way you see life. Get to know the new rich, the one that makes the amount of money needed for the way of living he really wants—but not more—being able to work less hours as a result. Get it from Amazon. Hope you found this useful. I strongly believe that, even when books tell us things that are damn simple and obvious, advice from people who learned the hard way, after years of experience, is extremely valuable. No matter how basic their recommendations are, they are useless if we don’t make an effort for them to be present in our daily lives. We all know "the right thing to do," but do we actually do it? August 12, 2015. I was on holiday in my hometown, Málaga, south of Spain. The summer was a transition between living in the United Kingdom to living in the United States—to disconnect and sort out a fair amount of paperwork I had to do before leaving. That day, I had an appointment to renew my Passport at the police station. That was all I would worry about that morning. I got inside the building, said my name at the front desk, and heard the magic words: "Please, wait here." And there I was. I had been given a precious gift. A few minutes or, maybe, half an hour, when all I could do was just sit there and wait for my turn. A span of time in a context you would never decide to be on your own, but now you have been forced to. All you have to do is sit there and do nothing. It is a precious moment for yourself. A moment when you can think. You can empty your mind. You can write. You can listen to music. You can do nothing.